Create reports in Windows 8 applications. Stimulsoft Reports.WinRT provides a set of tools to easily design and view touch enabled reports. Quickly and easily interact with your report content by zooming, dragging, sliding and scrolling. You can use Stimulsoft Reports.WinRT to create reports that run on both ARM and Intel based versions of Windows 8 without any modifications. The components were created in C# and can be used with any program or library compatible with the Windows 8 runtime. Stimulsoft Reports.WinRT includes a report viewer with a touchable interface. Quickly and easily interact with your report content by zooming, dragging, sliding and scrolling. Touch reports and get visual response on your actions. The reports viewer is powered by animations for all aspects of the report interaction. Create real-world business applications including banking, financing services, communications, education, government, manufacturing, healthcare, travel and insurance. The reporting tool is created with help of the Windows 8 runtime. You can use Stimulsoft Reports.WinRT to create reports that run on both ARM and Intel based versions of Windows 8 without any modifications. The components were created in C# and can be used with any program or library compatible with the Windows 8 runtime. You can use any programming language which supports WinRT. The Stimulsoft Reports.WinRT report engine is powered by the with the WinRT printing core. Stimulsoft Reports.WinRT provides a Windows 8 viewer for your reports. Save reports in more than 30 different file formats such as Adobe PDF, Microsoft Excel, Microsoft Word, XML and others. 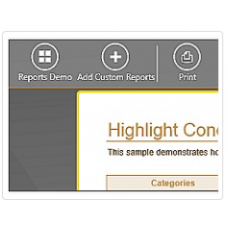 Stimulsoft Reports.WinRT includes a fully featured report designer for creating reports. You can create, design and view reports with help of an intuitive interface. The report designer is localized into more than 25 languages. Once the report is created you can save it to file or in the Cloud. Flexible Licensing Model.